I have a question about dialog boxes on my computer. This is something I mentioned last night, and I’d appreciate some help. Mac trivia! While the Mac (actually, the Lisa, but the Lisa informed the Mac) was being designed, the “OK” button did used to be an action: it used to be labeled “Do It.” But the space between the two words was too small, and the users read the button label as “dolt” and got kind of offended and wouldn’t push it. True fact! The keyboard shortcut for “OK” is the Return key, and that’s on the right of my keyboard, which matches the position of the button on the dialog boxes. The shortcut for “Cancel” is the Escape key, and that’s on the left, also matching the button position. 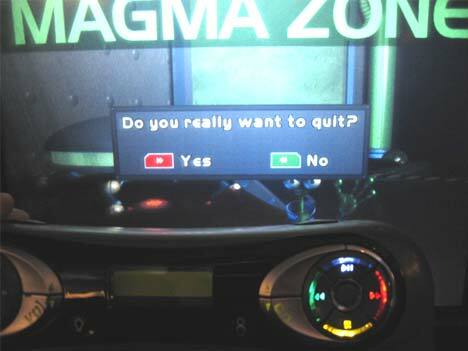 I’m trying to exit a game called “Magma Zone” and the game is giving me a confirmation dialog. The options are the way round we use in speech, “Yes” then “No.” However, the button for “Yes” is on the right of the control pad – which you can see in the bottom half of the picture (I’m holding it up to the screen) – and the button for “No” is on the left. The dialog box, which you see, and the control pad, which you act on, have the buttons in opposing directions. When you’re half asleep on a plane, in a funny kind of state anyway, this interface is catastrophic. Even when I knew what was happening, when I’d already taken a photo and examined the remote and so on, even when I knew all that, it took me a good few tries to leave the game. This interface is wacky fun. The dialog’s colors and arrows are the reverse of the game controller’s. A few other things bug me: the cornercut on the dialog boxes is in the opposite direction of the arrows, the dialog box violates the vcr/dvd button metaphor of the controller, and the red and green might be a problem for red/green colorblind users. How are the controller buttons used in the game? Tangential question: The most frequent case should be the easiest and quickest to use. Are right handed people faster with right handed input? Is that a factor here? Do people associate the common case with the quickest input method? The most obvious point – so obvious I didn’t spot it until I’d looked at it for two minutes! – is that green is normally associated with ‘go’ and ‘red’ is normally associate with ‘stop’. That combined with counter-intuitive posititoning and all the other points made by furvyn mean it’s a wonder you’re not still playing the game now! My tangential point: This reminded me of how my little sister used to ask questions when she was very young: “Would you like to go and play? No?” “Can I have an ice cream? No?” Everything was phrased like that with a trailing interrogative ‘No?’. You’ve got to hand it to her though, it worked a treat – it was so disarming/confusing you couldn’t help but comply! furvyn: On the left side of the remote control there are 4 cursor keys. For the games, those seem to be the main controllers, and then the coloured keys are used for supplementary actions. I can’t remember exactly what they were in Magma Zone, and whether the red and green keys were used for anything else in-game. On the subject of handedness, that’s something I’d like to know too. There’s probably some precision component, and if anybody knows an ergonomics expects, they might have some rule of thumb. Jez: The red-as-negative point is a good one, and one I didn’t realise until it was pointed out! I wonder how much it contributes to the confusion vs the positioning of the buttons? Position seems very important, which is in Don’t Go There [Hack #56] in the book, I think (responses want to be in the same direction as the stimulus), but how much is the colour thing involved, as a learned thing? I have a few more questions on the right-to-left processing. But they have to do with mousing, not game controls. (1) Where do users typically “leave” there mouse on a screen when it is not in use? Is there a typical behavior? (2) Do you remember a cogsci experiment showing the reaction time participants had when asked to mentally navigate to a position on a map? I seem to recall that the timing showed that the users spent mental time “walking” to the position. (3) Taking that experiment into consideration, and working with the assumption that users are reading left-to-right — Would there be a mental “travel time” for a user to back track to an earlier word? And would that affect their mousing time? And, I presume the mouse resting behavior of the user would affect it as well. I hope I explained my question well, and I hope I’m not mangling the experiment. It’s been a long time since I read about it. I have more questions. later.